I’ve never seen a Kabuki show in person but I’d like to at least once in my lifetime. I don’t understand Japanese well enough to say I’d follow the story completely but my Japanese friends have told me that the language used in Kabuki is so old not even they completely understand what’s being said. “Kabuki means when broken down “Sing” “Dance” and “Skill” and it started around the year 1600. Kabuki (歌舞伎?) is a classical Japanese dance–drama. 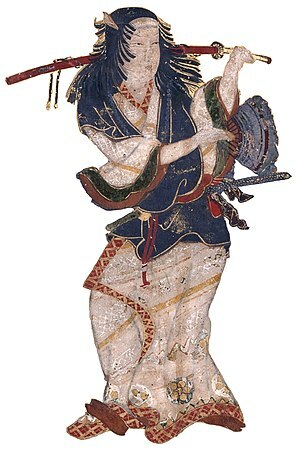 Kabuki theatre is known for the stylization of its drama and for the elaborate make-up worn by some of its performers. Much like old Shakespearean plays, traditional Kabuki performances consist of all males casts. 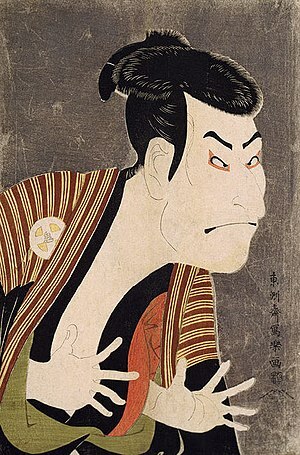 What’s interesting, however, is that Kabuki was believed to have been started by a woman. “The history of kabuki began in 1603 when Izumo no Okuni, possibly a miko of Izumo Taisha, began performing a new style of dance drama in the dry riverbeds of Kyoto. It originated in the 17th century. Japan was under the control of the Tokugawa shogunate, enforced by Tokugawa Ieyasu. The name of the Edo period derives from the relocation of the Tokugawa regime from its former home in Kyoto to the city of Edo, present-day Tokyo. Female performers played both men and women in comic playlets about ordinary life. The style was immediately popular, and Okuni was asked to perform before the Imperial Court. In the wake of such success, rival troupes quickly formed, and kabuki was born as ensemble dance and drama performed by women—a form very different from its modern incarnation. Much of its appeal in this era was due to the ribald, suggestive themes featured by many troupes; this appeal was further augmented by the fact that the performers were often also available for prostitution. For this reason, kabuki was also called “遊女歌舞妓” (prostitute-singing and dancing performer) during this period. Kabuki became a common form of entertainment in the ukiyo, or Yoshiwara, the registered red-light district in Edo. A diverse crowd gathered under one roof, something that happened nowhere else in the city. Kabuki theaters were a place to see and be seen as they featured the latest fashion trends and current events. The stage provided good entertainment with exciting new music, patterns, clothing, and famous actors. Performances went from morning until sunset. The teahouses surrounding or connected to the theater provided meals, refreshments, and good company. The area around the theatres was lush with shops selling kabuki souvenirs. Kabuki, in a sense, initiated pop culture in Japan. Author hikikomori78Posted on October 27, 2013 October 13, 2013 Categories Film, Japan, UncategorizedTags Culture of Japan, Edo, Izumo no Okuni, Japan, Kabuki, Kyoto, Tokugawa shogunate, Tokyo4 Comments on Not Halloween… Kabuki. Not perfect, but a nice balance of city and country. View from our bedroom in Japan 2008. Some times I feel like Godzilla is coming over that ridge at any moment… If he did, I think I’d try to hug him. Back in my art history days, in high school, I remember Daibutsu (The Great Buddha). And to be perfectly honest I never thought I’d see him in person. Now that I have, photos don’t do him any justice. “The Great Buddha of Kamakura is a monumental outdoor bronze statue of Amitābha Buddha located at the Kōtoku-in Temple in Kamakura, Kanagawa Prefecture, Japan. The bronze statue probably dates from 1252, in the Kamakura period, according to temple records. It was preceded by a giant wooden Buddha, which was completed in 1243 after ten years of continuous labor, the funds having been raised by Lady Inada (Inada-no-Tsubone) and the Buddhist priest Jōkō of Tōtōmi. That wooden statue was damaged by a storm in 1248, and the hall containing it was destroyed, so Jōkō suggested making another statue of bronze, and the huge amount of money necessary for this and for a new hall was raised for the project. The bronze image was probably cast by Ōno Gorōemon or Tanji Hisatomo, both leading casters of the time. At one time, the statue was gilded. There are still traces of gold leaf near the statue’s ears. It is unclear, however, whether the statue constructed in 1252 is the same statue as the present statue. The hall was destroyed by a storm in 1334, was rebuilt, and was damaged by yet another storm in 1369, and was rebuilt yet again. The last building housing the statue was washed away in the tsunami of September 20, 1498, during the Muromachi period. Since then, the Great Buddha has stood in the open air. Still working it out… but I have more pictures from my first trip to Japan! Haven’t been here since 2008. Anyone know the name of this temple/shrine? I’ll never forget my first trip to Japan. No matter how much you try to prepare yourself for the culture shock and the endless awkward silences your poor Japanese creates, you’re just not ready for its rich history. Every time I’ve gone back I’ve taken over a thousand photos. The visual stimulation is just incredible. Maybe I should put that photo book together… No matter how many photos are taken everyday, no two people will see everything the same way, right?